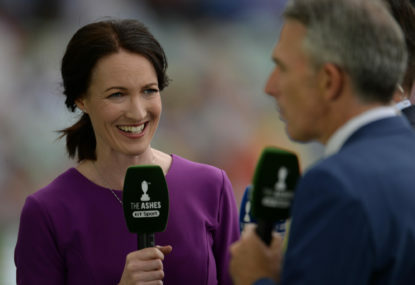 Alison Mitchell will become the first woman to commentate ball-by-ball on Australian cricket this summer after confirming she had signed on with Channel Seven today. Seven, alongside Fox Sports, signed a new six-year deal to broadcast Australian cricket starting this summer, with the network to cover all Test matches, 43 Big Bash League matches and all women’s international matches. Mitchell is a well-respected commentator and has called cricket both at home in England and away in India, Australia and Sri Lanka. The announcement from Seven today also confirms Mel McLaughlin will co-host the Test cricket alongside James Brayshaw, who has been with Seven for some time covering the AFL. Brayshaw will then double as a ball-by-ball commentator, with the free-to-air network also using Tim Lane as their third caller for Test matches. While it had already been announced Seven had secured the signatures of Michael Slater, Ricky Ponting, Glenn McGrath and Damien Fleming, it’s been confirmed this morning that Jason Gillespie, Simon Katich, Brad Hodge and Greg Blewett will all join the team. Gillespie will feature as an expert for the Adelaide Test against India, while Katich will cover both Sydney and Melbourne. Brad Hodge will join Seven as a Big Bash League expert. Seven have also found a role for long-term broadcaster Bruce McAvaney, who will conduct interviews during the lunch break of both the Sydney and Melbourne Tests. The announcement from Seven gives a much clearer picture of their team for the upcoming summer. Fox Sports, on the other hand, have also signed female talent with Isa Guha and Mel Jones on board. They are joined by long-term Fox Sports broadcaster Mark Waugh, along with former Aussie wicketkeeper Adam Gilchrist, Shane Warne, Allan Border and Brendon Julian. More announcements are expected soon from Fox Sports, given they have a huge summer of cricket to broadcast including every international fixture, a number of exclusive BBL games and all of the women’s international cricket and WBBL. The broadcasters have announced they will have separate commentary teams on each match being broadcast.